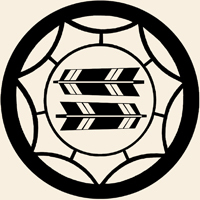 I was just wondering if anyone could share information about any mon (family crests) are that are Bujinkan related? I was looking for the Toda family Mon in particular, but perhaps Mon related to the Kukishin Ryu or Takagi Yoshin Ryu would be easier to find. sorry I cant help any better than this, maybe someone Japanese could find the others? This particular mon (sorry forgot the japanese name) was actually used by a number of different families. I have heard that the Kuki also used it bu don't have positive proof. Soke would probably be the only person to really know. A true heart will always win out as it can be read like an open book! Yes that mon can be found anywhere in Japan. You can even see it on many Katana Koshirae (mountings). Even Paul Chen had a Katana mounting with that symbol. This symbol has many meaning for Japanese as far as I know but I am sure there are people here knows better than me about these meanings so I cut it here. I thought the kuki mon had a connection with the collection of stars next to the north star. Possibly the Pleiades or seven sisters. In Japan this star cluster is called Subaru. You can see them on the car badge of the same name. that particular mon is called mitsu tomoe (domoe sometimes) 三つ巴, literally "three commas". Yes it is called tomoe, there is versions with two and four tomoe as well. Maybe we should be careful and not confuse our Kukishin tradition with the Kuki family tradition too much. Assuming both is the same is wrong I think. Asking Soke would probably be best. For others I don't see anything? Any clues? It seems I was wrong the first Mon, in my previous post, was iga-ryu's Mon and not a Mon from Togakure only. Nobody knows more on that? "There is no bad system, it is a sum of individual acts of cowardice"
"The opposite of hope, not despair, but courage"